UK based global telecom major Vodafone Group Plc wants to invest more than $2 billion in its Indian venture and becomes the first mobile operator to have the advantage of 100% foriegn direct investment. Telecom Minister Kapil Sibal informed this in Delhi. In August this year India’s Telecom Commission approved the removal of limit of foriegn direct investment in telecom sector. Earlier it was capped at 74%. Telecomtalk forcasted that Vodafone India, second largest mobile operator would be among the first companies to get complete FDI. Vodafone entered in India in 2007 by acquiring Hutchison Whampoa’s shares in Hutchison-Essar for approximately $11.1 billion. In 2011 Vodafone acquired 33% shares of Essar in the venture, yet keeps 74% ownship in their hand to comply Indian rules to 74% FDI. As the cap is removed now Vodafone will creates its 100% owned Indian subsidiary for better control over the company. 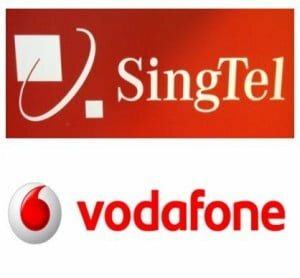 In an another development Singapore-based telecom major SingTel wants to take total control over its Indian arm, SingTel Global (India) Private Ltd which is a international long-distance (ILD) service provider in India since 2007. Currently Bharti Enterprises Ltd & Leela Lace Software Solutions have 9.9% & 16.01% stakes in SingTel Global respectively and SingTel when allowed by Foreign Investment Promotion Board (FIPB) will buy these 26% shares from these two minor share holders. SingTel owns 32.34% shares in country’s largest mobile operator Bharti Airtel. RDB, there is one more aspect to this. The new rules ban companies from holding shares in a direct competitor, it means SingTel will have to sell their 15.57% share in Bharti Airtel. In the same manner, Vodafone which has 4.4% share in Bharti Airtel will have to sell it.